This season of The Walking Dead is soon coming to a close, and the conflict with Negan and The Saviors has only continued to escalate. Starting with the midseason premiere, we’ve seen close call after close call with the seemingly endless supply of Saviors. Luckily an RPG, Carol’s badassery, and Eugene’s teeth have helped in saving our group of survivors from their wrath (except for Denise). Well, it appears that good luck may be coming to an end. The cast has been hinting that Season 6’s final episode “Last Day On Earth” is extremely dark and gut wrenching. Andrew Lincoln couldn’t sleep the night before filming, Melissa McBride was left speechless by the script, and Lauren Cohan said filming was the hardest day on set thus far. From what we’re seeing in this trailer, that definitely makes sense. For one, we see our first glimpse of Jeffrey Dean Morgan’s Negan. While he’s been referenced a handful of times, fans have been waiting for the psychotic comic book villain to finally make an appearance. 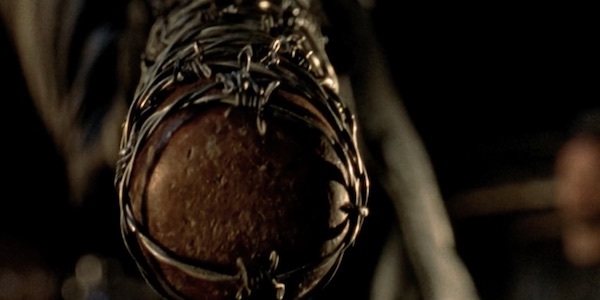 Although we’re only shown the back of Negan’s head, and are privy to his introductory dialogue, we are shown something massively important: Lucille. Lucille is Negan’s weapon of choice- a bat wrapped in barbed wire. In the comics, he uses this weapon in his first interaction with the survivors by surprisingly killing a major character. This trailer hints that same moment, with Lucille looking terrifying. Of course, we don’t know which character will be meeting their end at the hands of Negan. One of the other interesting moments in this trailer include a quick shot of Carol’s hand. Last week’s episode ended with Carol’s letter claiming that, in order to avoid killing, she would depart from the group. The hand we see has Carol’s rosary beads, and is covered in blood. It almost looks walker-ish, as there seems to be no life in the hand itself. Presumably Morgan’s journey on his horse is so find Carol and bring her safely back to Alexandria. Which means two of the strongest characters in the group won’t be there to help Rick and company fight Negan. Overall, this trailer makes it seem like a few people are going down as Season 6 draws to a close; Denise’s surprise death seems to be telling for the rest of the Season. After all, who is on the ground in the opening shot when Rick the group meet up with the Saviors on the road? Are they dead, too? We think we know who's going to die. Do you guys agree?